Mark Devereux Projects supports visual artists through mentoring, critical dialogue and curatorial production. Each practitioner’s artistic and career development is paramount, as the organisation provides bespoke guidance, information and opportunities. 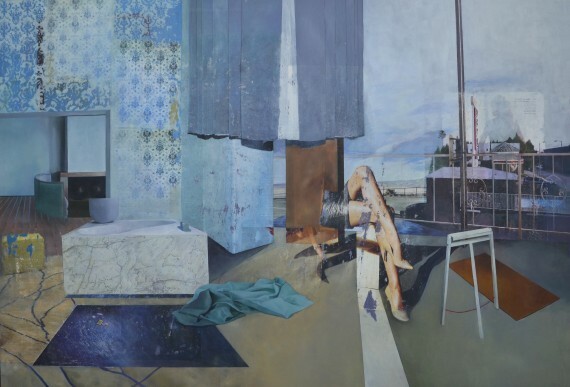 Looking at the reflection of reality is Mark Devereux Projects’ second annual associate members exhibition, showcasing the strength and diversity of its membership, currently comprising over 50 artists. The exhibition was open entry to all artists, working in any medium, who are members of Mark Devereux Projects. Each year, the changing panel is made up of artists, curators and writers invited to select artist’s work. This year’s exhibition, Looking at the reflection of reality has been selected by Kitty Anderson (Cuartor, The Common Guild, Glasgow), Stuart Tulloch (Curator, Ikon, Birmingham), Derek Horton (Director and curator, &Model, Leeds) and Mark Devereux (Director, Mark Devereux Projects). The selected artists are Rob Davies, Marco Giordano, Aylwin Greenwood-Lambert, Evi Grigoropoulou, Joe Hancock, Laura Napier and Mary Wintour. The theme of exhibition, Looking at the reflection of reality, challenges the notion of how we see and understand elements within our daily lives. Come out and celebrate the opening of the exhibition in winter cheer with festive drinks on Thursday 4 December (7-10pm) at Manchester’s Federation House. Looking at the reflection of reality coincides with several exciting art events happening in the city that evening, including 30 Years of the Future with our friends at Castlefield Gallery and Hankering for Classification at Toast, also at Federation House. On the first day of the exhibition, Mark Devereux Projects are welcoming the team from Backlit, Nottingham (gallery and studios) to Federation House for a series of one-to-one mentoring and advice sessions as well as an evening talk. As part of the ongoing critical dialogue & talks programme, each member of the Backlit team will be available to meet with artists during the day. Later in the day, Backlit director, Matthew Chesney’s will present a talk and discussion about ‘The role of the Artist Curator’. For further details about Looking at the reflection of reality, opening times and information about the critical dialogue & talks event please visit markdevereuxprojects.com.